Good news for gamers: | Inkdependence! Video game addicts are not shy nerds! 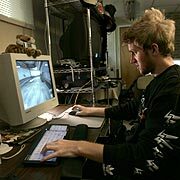 The AMA has considered adding video game addiction to the list of official addictions in the DSM. This psychology grad in Australia has shown that we MMORPG players aren't the basement-dwelling, anti-social, socially inept trolls that we are stereotyped as. I don't count myself as an addict of anything (except JUSTICE), but I have always resented the public perception that gamers have gained over the years. I don't live in a basement, I don't have any social issues, and I can put down the game when I need to do so. I've known a lot of different gamers in lots of different games and I've never known one who matched the stereotype. Thanks for bringing the science, Daniel Loton! Dude, I just need one more hit of justice to get me through the weekend.